Place the oven rack in the middle of the oven and preheat oven to 350 degrees. 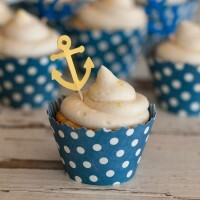 For cupcakes, line a cupcake tin with paper liners (or grease and flour each individually). This recipe can also be made in 3-9″ round cake pans. In a measuring cup, combine the milk, buttermilk and vanilla. In the bowl of a standing mixer fitted with the paddle attachment, cream the butter, and shortening until smooth and creamy. Slowly add the sugar, one cup at a time, beating well after each addition. Add the eggs, one at a time, making sure each is incorporated before adding the next one. Add 1 cup of the flour mixture to the butter/shortening, and mix until incorporated. Then add half the milk mixture, and mix well. Repeat, ending with the flour mixture. Scrape down the sides of the bowl as needed. Once all the flour as been added, mix until smooth and well combined. In the bowl of a standing mixer fitted with the paddle attachment, combine the butter and cream cheese. Mix on medium speed until creamy. Add the lemon curd and mix until combined, then add the vanilla and lemon zest and mix well. Gradually increase the speed to high and continue beating until light and fluffy. Scrape down the sides of the bowl as necessary. Add the powdered sugar, 1 cup at a time, beating after each addition until smooth. Continue to add the powdered sugar until the desired consistency is reached. Add a little milk or cream if necessary. To achieve a really light, fluffy frosting, beat on high 2 minutes.